Call it the most powerful scientific tool ever built. Call it a new paradigm of computing. Just don’t call it slow, because whatever number you look at, Summit — which made its debut at the Oak Ridge National Laboratory — is flat-out fast. This massive machine, powered by 27,648 of Volta Tensor Core GPUs, can perform more than three exaops, or 3 billion billion calculations per second. That’s more than 100 times faster than Titan, previously the fastest U.S. supercomputer, completed just five years ago. And 95 percent of that computing power comes from GPUs. The story behind the story: The team at Oak Ridge was the first to realise — almost a decade ago — that a new kind of computing was needed. The old paradigm of piling one transistor on top of another wouldn’t deliver the efficiency they needed. Summit is the next chapter. Not just for ORNL, but for all of computing. The research team has been working with the DOE for more than 11 years on advanced technologies, including the Volta GPUs and NVLink high-speed interconnect technology at the very heart of Summit. Instead of one GPU per node, Summit has six Tensor Core GPUs, delivering 10x Titan’s simulation performance. And just as Titan inspired the world to accelerate simulations, Summit will inspire the world’s scientists to harness AI to drive discovery hand in hand with simulation. “Summit is a new breed of computer It is the world’s largest AI supercomputer, a machine that learns. Its software will write software — amazing software that no human can write. But while Summit will share DNA with a new generation of machines built for AI, it will work at speeds like no other. 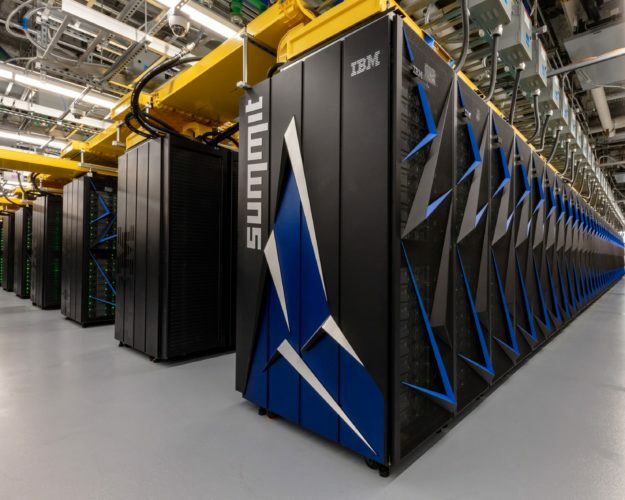 Researchers will be able to use the simplified calculations, known as half-precision, or FP16, to boost Summit’s performance about 15x to exascale levels — more than a billion billion operations per second. Cancer Research:The DOE and National Cancer Institute are working on a program called CANcer Distributed Learning Environment (CANDLE). Their aim is to develop tools that can automatically extract, analyse and sort health data to reveal previously hidden relationships between disease factors such as genes, biological markers and the environment. Fusion Energy:Fusion, the energy source powering the sun, has long been touted for its promise of clean, abundant energy. Summit will be able to model a fusion reactor and its magnetically confined plasma, hastening commercial development. Disease and Addiction:Researchers will use AI to identify patterns in the function and evolution of human proteins and cellular systems. These patterns can help us better understand Alzheimer’s, heart disease or addiction, and inform the drug discovery process. Using techniques like machine learning and deep learning at a massive scale, scientists will achieve breakthroughs on Summit that will boost the economy, improve healthcare and help deliver limitless energy. This could help save the planet, and that’s why we need faster supercomputers. And that’s why the next great computing challenge has already been set: building the world’s first exascale accelerated supercomputer. We’re already racing to help get this done, so the scientists and researchers of the world can continue racing forward.